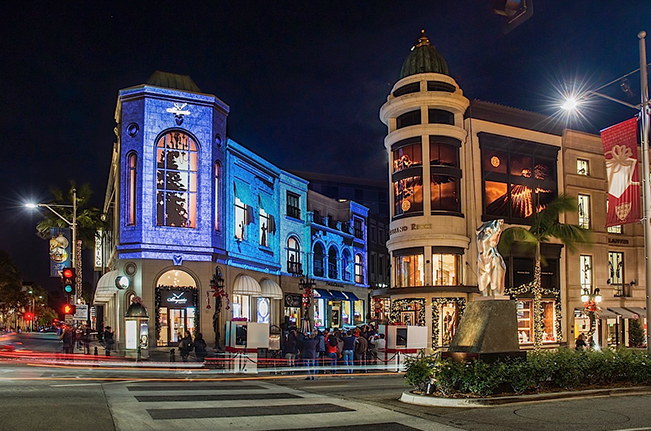 Two Rodeo Drive worked with PaintScaping, Inc. to create a custom holiday 3-D light show for 12 days of Christmas. The shows were brought to life with theatrical music and PaintScaping’s signature 3-D projection mapping wizardry, which magically transformed Two Rodeo Drive into a winter wonderland. PaintScaping is an industry pioneer in 3-D mapping, using walls instead of screens for a canvas. It precisely aligns dazzling light and animation with a building’s architectural features to blend real and virtual worlds.